A solar paneled generator has many advantages over a conventional generator. Where you will have fume and continuously must ensure you have gas that produces fumes, you can have a noiseless and portable inverter solar panel generator. 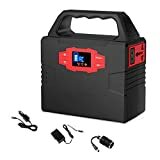 In addition, can you not only have power during emergencies, but a portable generator is great for picnics and camping trip. 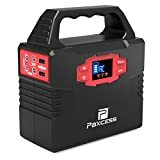 Choosing a unit however could be problematic when you do not know what to look for, thus are we presenting you with the top 10 inverter portable solar panels generators. With the Solaroak you have the ideal opportunity to have electricity when you go camping or emergencies power outages too. A bright LED light will let you know the status of your battery life while you can check the progression of your charge for example charging an electronic device or smartphone. The Isunpow is powerful and portable and can be taken on any outdoor trip or emergency home use. It takes between 7 and 8 hours to fully charge using a wall adapter after which you will be able to charge multiple devices for up to four hours. In addition will solar charging take longer, and car charging is possible too. You will be able to use the generator up to 500 times with the lithium ion battery. The Rockpals is excellent for campers and outdoor people and even those at home with an electricity emergency that need power. What we like about it is that you do not have to do separate shopping for solar panels and cables and accessories as it comes as an all-in-one complete kit. It is great for RV campers who need to keep mini fridge running or charging tablets, smartphones etc. too. The complete kit includes adaptors, charger cables, the portable generator and 50-watt solar panel. 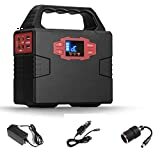 With the Webetop 250 watts you have an easy carry portable generator with inverter battery power. 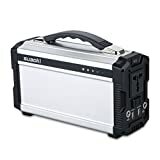 The lithium ion battery is very powerful making it excellent for camping trips, etc. it features three DC outputs, three USB outputs as well as AC power outlet. During electricity outages you will have powerful light with integrated flashlight too. It operates with silent cooling fans to prevent overheating. It can be charged via car socket, electrical outlet or solar panel. The Wegner with 9000mAh rechargeable battery is one of the few inverter portable generators that is sold with its 6-watt solar panels. 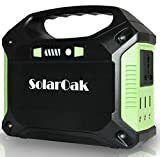 It is ideal for camping and home use during emergencies and charge either using its solar powered option or wall adapter. In addition, do you get all cables and connectors with the package. 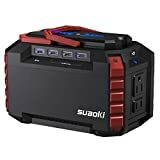 The Suaoki has a battery pack of 13, 500 mAh with integrated flashlight, pocket to store additional cable and connectors that you get with when buying the affordable Suaoki inverter generator. The solar panel also folds to a compact size and stored with the portable generator. You can charge it via solar panel which is not included with the generator or via wall plugging and car charging which cable is included. 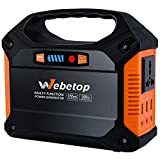 The Webetop is lightweight and compact with great features which includes its battery management system that is there to keep you and your appliances and electronic devices safe and unharmed. It also acts as flashlight during emergencies and power outage with a bright flashlight that will shine for up to 125 hours when fully charged. It operates silently and operates at 100 watts and easy to use. The coolis offers you an ideal opportunity to remain with power during outages and great for RV use and camping. It has a clear LED screen that displays battery use and charging. You can charge the inverter solar generator via the solar panel adapter; car charger or wall unite too. While solar power will take longer it is seven hours only to fully charge the device via wall. it is silent and small. The Paxcess is a best seller for many reasons including its affordability. This 100-watt solar panel generator is full portable and easy to take anywhere like camping trips, etc. it is great for charging iPads, iPhones, tablets, laptops and other electronics devices but will also allow you to watch TV. Since it is silent and gas free can you use it anywhere. It charges easily either via its solar panels, wall outlet or in addition work on your car charger. You can charge your electronic devices directly from your generator with its integrated USB ports. 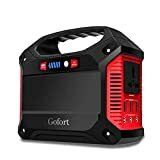 We conclude with our top 10 inverter portable solar panels generators and trust that you will be able to make an informed choice for your next camping trip or even during electricity power outages.